Christmas is near and it’s oh so important to know how we’re going to present our dishes and decorate the Christmas table. Our interior designers have given us some tips and guidelines for Christmas table decorations for 2018. Let your creativity flow. There are endless possibilities for our Christmas table decorations. Whether you prefer a traditional table in red and white or a more festive and elegant variation, here you have some classic and modern combinations. One of the most important Christmas traditions is sharing meals with loved ones. It’s sitting down for a Christmas Eve dinner or Christmas lunch, served on a nice table decorated for the occasion that makes this time of year special. In order to get your Christmas table decoration right you’ve got to take every detail into account, so nothing is missing. However, overloading it is a big no no, we need space for food and empty space to avoid saturation. 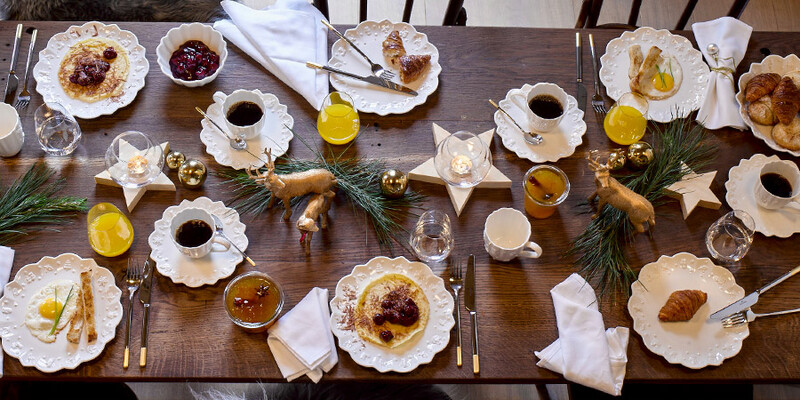 Whether we want a minimalist style Christmas table, or if we want to go to the other extreme, the first thing we have to think about is what kind of tablecloth we’re going to use. A white or cream coloured tablecloth has the advantage of highlighting what we are going to use to decorate the dishes, centre piece, glasses, napkin rings, etc. 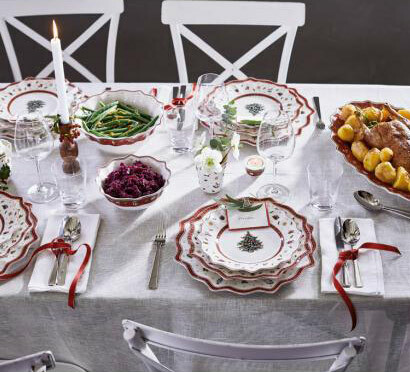 If we want to use a christmas themed tablecloth, it’s best to use white plates (which can be square or oval in shape) and make sure the centre piece is nice and simple. It’s a good idea to keep the palette to just two colours and use those on the table. For example: if the tablecloth is light in colour, the rest of the table can be in blue and gold (very elegant), red and gold, silver and green, whatever you prefer. On the other hand, we can follow this year’s trend which is all about gold. Gold will dominate at the end of 2018, always combined with dark but intense tones such as brown, midnight blue and burgundy. The result: an elegant style, both sophisticated and beautiful. How about printed tablecloths? They’re not a bad idea as long as we know which pattern to choose or don’t end up overloading it. 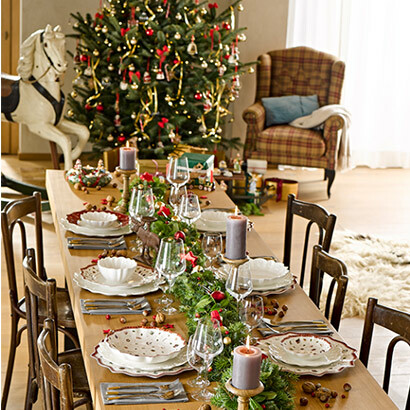 Think that already the Christmas table will be full of glasses, glasses, plates, cutlery and other elements, not forgetting the centre piece. If your tablecloth is going to be decorated, try not to be too flashy, or bet on one that has light colors like white. Every time you are betting more for not using tablecloth or using place mats, as they are quite sophisticated. The next logical step when deciding how to decorate our table will be choosing the right set of dishes, as well as the cutlery and glasses. The usual bet is on good tableware, the kind we keep for big occasions and although it’s certainly a good idea, you may have lost pieces over time and don’t have the whole set anymore. First things first: think about the number of guests you coming over and make sure you have enough pieces. I wouldn’t recommend using dishes from different sets, as it breaks the harmony and elegance of the table. If you are thinking of buying a new one, here are some of our favourites, the ones we use to decorate our most exclusive clients’ tables. The same recommendations apply to choosing your cutlery. Start by deciding which cutlery you’re going to use. You must place fork and knife (spoons in case there is soup or consommé) and of course, the dessert spoon. If you are going to serve fish you should also set a fish knife. As for glasses, always place both a glass for water and another glass for wine. Then you can remove one or the other depending on what the guests drink, but it is important that they find both when they sit down at the table. 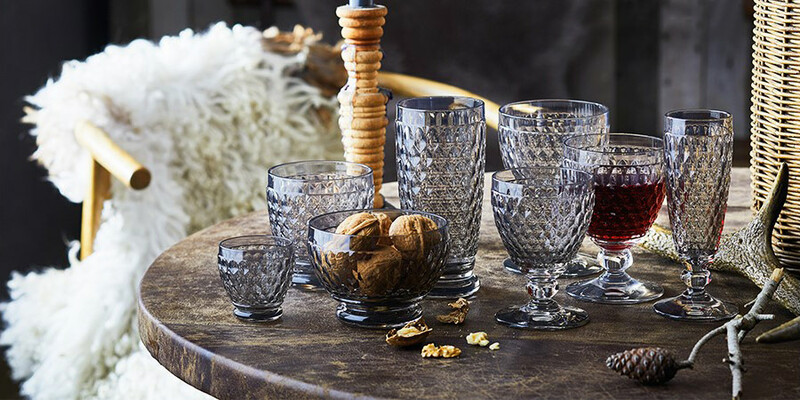 Regarding glasses for the Christmas toast, it’s best to wait until the end of the meal before bringing them out so you save valuable space on the table while we enjoy our Christmas meal. 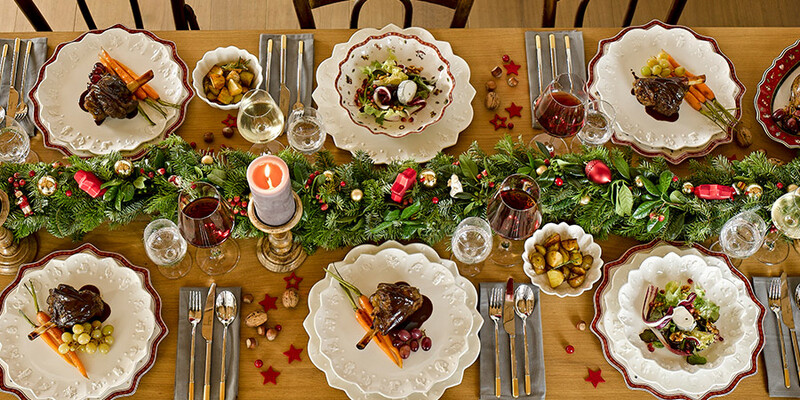 Here are a few tips so you lay your Christmas table beautifully. Start with the dishes: first we lay the base plate, which will be the main flat plate, on top of that, we place the dish that our first course will be served on, and on top of the latter, we place the starter plate. The idea is that as we eat, we remove the plates we’ve already used. As for cutlery, we place from the outside towards the inside in the order they’ll be used. To the right of the plate, we place knives (with the cutting edge towards the plate), the spoon above the plate, and the shovel for the fish. To the left we have to put the forks, first we place the normal fork, and then the dessert fork. Glasses are placed as follows: first the wine glass, then the water glass and, finally, the cava flute, although this may be placed at the end, when the time comes for the toast. Putting candles on the Christmas table as well as a beautiful center piece is a fantastic idea. How to choose a nice centre piece. Putting candles on the Christmas table as well as a beautiful center is a fantastic idea. There are many models of centre pieces or candles that we can place on the Christmas table. They can be different styles and colours depending on how you have decorated the table. The candles should be small so that your guests don’t burn themselves when they reach out to help themselves. We can also place them while our guests arrive and then remove them once they have sat down at the table. And, very important! Do not forget to choose some nice napkins that match the table décor. A folded napkin in the shape of a spruce tree will give a very special touch to your decoration. 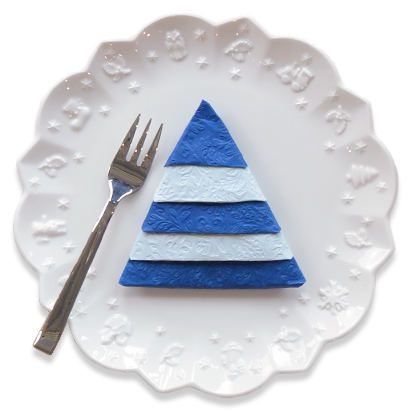 You can surprise your guests by creating a fir tree with a simple paper napkin like the one in the image. If you want professional advice on how to decorate your home or business, remember that at Mobile Design we have a team of specialists who will be happy to help you. Click here to contact us.